The area where Bruma now is was originally Settled at the end of the Second Era by the soldiers of King Cuhlecain, who ordered the construction of a great fort/castle in the area that would consolidate his control over Pale Pass; serving as an impenetrable barrier with its strong garrison together with the Jerall mountains, in case any Nord or Reachmen tribes managed to push his forces out of the distant and difficult-to-govern Falkreath. Unfortunately Cuhlecain died before it could be finished, but Tiber Septim embraced the project and completed it, making it the base for one of his legions. The advantage of having such a fortress is that if any southern threat were to capture the Imperial City, Tiber Septim and his armies could fall back to the very defensible Jeralls, where he would be backed by the armies of the Nords of Skyrim, who were fiercely loyal to him due to his alleged Atmoran backround and all that. Later on during the Septim Dynasty rule, the fort remained an immensely important military asset, with a whole legion occupying it. Since this fort was in such an isolated, cold place, many Nibenese and Nordic people decided to settle the area surrounding the fort, looking to make a living by offering services to the legionaries. Like that, a sizable city grew around the fortress. In 3E 110, Antiochus Septim ordered the extension of the walls to encompass the city due to his overestimating the threat of the Maormer who had begun an invasion of Summerset that year, so a proper defence was needed if it became necessary to fall back to Bruma. Observing the size and importance that Bruma had accumulated, and the political power vacuum in Northern Cyrodiil Antiochus decided to give Bruma the status of County seat. But this county would work diferently from other counties. The countship of Bruma would be non-hereditary. Instead, it would be associated to a military rank, namely, the general of the legion based at the fortress, and it is often granted to generals most favoured by the Emperor. This tradition still remains to this day. The city would be patrolled by the soldiers of the legion, and have architecture that mixes Colovian and Nord influences (somewhat like Solitude in TES V, I suppose), while having traces of the colourful, exotic Nibenay. Economically, besides the services to the legionaries (brothels, taverns, bathhouses?) an industry has grown around the good quality timber found in the area. I picture large tree trunks being floated down a river towards the Imperial City. I had more ideas, but I can't remember everything. This text could easily be used in an ingame book called History of Bruma or something in a slightly edited form. Nice job! You imply that the Bruma fortress is supposed to be a larger complex, which may or may not seem and look a little strange. That can still be discussed, though. I don't like the idea of having "traces of the colourful, exotic Nibenay" in the Bruma architecture. I'd leave it to mixing Colovian and Nord styles, certainly the Nibenay have close to no influence on this area and it would look rather dumb and impractical to have Nibenay stuff up in the mountains. Thanks, Scamp. I'll see if i can edit this to look good as an in-game book, If everyone is OK with the idea. Scamp wrote: You imply that the Bruma fortress is supposed to be a larger complex, which may or may not seem and look a little strange. That can still be discussed, though. I was meaning mostly that the castle should be larger than other city castles in a way that is noticeable to the player. Maybe something in the same vein as the castle of Old Ebonheart? The main visual point would be to make the castle stand out. Scamp wrote: I don't like the idea of having "traces of the colourful, exotic Nibenay" in the Bruma architecture. I'd leave it to mixing Colovian and Nord styles, certainly the Nibenay have close to no influence on this area and it would look rather dumb and impractical to have Nibenay stuff up in the mountains. I actually agree with you here. While I was writing it, it felt wrong, I just wanted to shoehorn some Nibenese influence in there, and see what people could make of it. But agreed, it wouldn't look good. While reading the nibenese-bit, I could actually envision it working rather well. Nords do not necessarily avoid color in their architecture, either. Just look at the skaal houses, to have an example. It wouldn't need to be additional color that gives the nibenese touch, though, it could just be cloth that is incorporated in some form or the other. Absolutely Nibenese influence in Bruma. One because it geographically falls in the East, two because it's referred to as Nibenese in Oblivion IIRC (I know the countess had hanging and tapestries all over her castle), three because the juxtaposition of Nibenay and Skyrim is what makes it so interesting. We're gonna be damn sick of Colovian architecture after Anvil, Chorrol, possibly Kvatch, and all the villages in between, plus it'll be a nice chance to show off hints of how the Heartland will look and maintain interest in the project. Don't get me wrong, I think nibenese influence is more than appropriate, I wouldn't have suggested it in the first place otherwise; but looking at it from Scamp's perspective, since he might well be the one to make the Bruma exterior, how do you make a city in this climate look Nibenese while maintaining a Nordic influence, besides making the building textures colourful? Granted, I don't have the most vivid imagination, but it might look a bit awkward because the most practical architecture in this climate is the Nordic one, and I'm not seeing how a hybrid of Nibenese-Nordic would look. Of course, we could have like half the NPCs be Nibenese, and decorate the interiors accordingly. Maybe some concept art is in order, because I would love to see it work, though we're still a long way off. I see lanes of brightly colored silk pavilions with tented canopies over the roads to keep the citizens warm and dry, intermingled with traditional Nordic architecture - and looming over it all, the cold, gloomy fortress where the Countess presides over them all. Silk is actually a really good insulator for trapping in heat IRL, and it's not necessarily waterproof, but we could claim that enchantments are woven into the silk to make it resist the elements. Bruma isn't too far from the Temple of the Ancestor Moths in Oblivion, so it wouldn't be terribly unbelievable that the priests are on commission with the county or something. Depends on the silk. Some insect silks are indeed waterproof. A little problem here: Bruma shows up in lore long before the end of the Second Era. The Shoni-Etta mentions a ruler of "Brumath", the "Beggar-King" as one of the Colovian kings who swore fealty to Reman I around 1E 2703 (I must admit, I also have personal plans for Bruma when it comes to several books). I do really like the ideas here, especially the Nibenese connection. In terms of a general timeline, it makes a lot of sense: the Colovian Estates split off from the Empire when the Marukhati came to power. Afterwards, however, the Alessian rule spread across Skyrim and High Rock, suggesting that the northern passes were still in Alessian hands. There are sources that suggest the area of Bruma and Sancre Tor were Alessian until the War of Righteousness. Bruma presumably gained independence after that conflict, and was considered Colovian by the time of Reman. As such, Bruma would be arguably more Nibenese-Nordic than Colovian in terms of history. 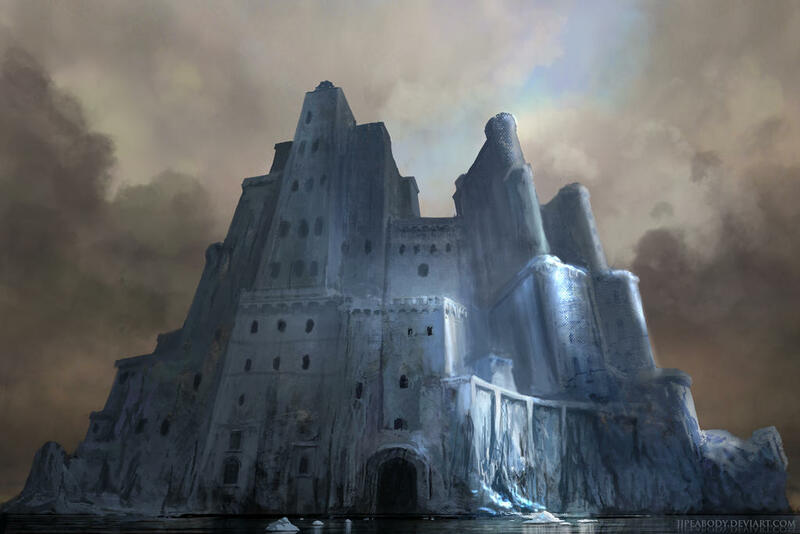 This is somewhat what I had in mind for the castle: cold, bulky and imposing. Difference is it would be on an elevated position and the base of it would be swarmed with the buildings of the city. I think Bruma should stay with the definite nord influences and look rustic and all. Perhaps some akiviri influences in there, but not too much. Tarius wrote: I think Bruma should stay with the definite nord influences and look rustic and all. Perhaps some akiviri influences in there, but not too much. Why? It definitely falls in the east (it's directly above the very Nibenese Imperial City), it's going to have strong Akaviri influences due to its proximity to Pale Pass, and isn't it way more interesting to explore some themes other than "log cabins and viking longhouses", which were done to death in Skyrim and are going to be explored plenty in SHotN? I agree, but I'm not attached to either theory on what it should be like. I think we should design something better than the log cabins, but its possible we go with them in the end anyway. Lore-wise, Bruma was very Nibenese in the First Empire, very Colovian under the second. It can go either way. A combination of east and west would be more interesting that Nordic stuff, as we've seen a lot of that already. If anything, we could keep Nordic references for a kind of semi-permanent market, something like Saint_Jiub's yurt/tent city idea, but with a clear Nordic slant. Skyrim traders coming in over Pale Pass could trade in furs, cattle (in the high season), mammoth ivory, amber, that kind of thing. The city proper would retain a unique identity that's not so dependent on the Nordic aesthetic. I really like the idea of having a "nomdic" nord market at the edge of the city proper. Could be very cool. Something needs to look good and we cant go wrong with the rustic nordish look. Changing something for the sake of change is not something I entirely agree with. I would honestly discuss this more in depth later when we actually get to this area. At least if discussing something as remote as Bruma causes so much disagreement. If any of you really want to see the nibenay happen sooner rather than later they should probably build a sub-group within P:C that does not cause an impact on the people that still try to create the colovian west.